This post introduces the premier issue of The Gardner Annals (Volume I, Number 1). 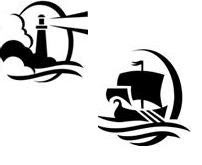 In the interests of the Society's purpose "to honor the accomplishments of the Cape Ann party and to promote, and to sponsor, scholarly research of a cultural, biographical, historical, and genealogical nature, with an emphasis on, but not limited to, the origins and the lives of New England immigrants," the Annals will allow presentation of results and materials related to the research that is sponsored by, or is of interest to, the Thomas Gardner Society, Inc. This issue provides a chronological view of some events of interest. The items have appeared in Gardner's Beacon issues starting with Volume II, Number 6. Accompanying the Annals will be a repository for information that will be of assistance to researchers. For example, we intend to post ahnentafels that have been fully referenced. Additionally, we will collect information about Patriots who may be documented, such as having entries in Massachusetts Soldiers & Sailors in the war of Revolution, but who may not appear in any approved ancestor lists, such as the D.A.R. database. The information in the repository has a purpose of encouraging further research. 08/07/2014 - With respect to the use of Margaret Fryer, see How Many Wives? and About Margaret. ... This, of course, is subject to research and discussion, but a strong case can be made that Margaret was busy with kids and not inclined to endure puritanical posturings. Too, Thomas did (deigned to do) his freeman's oath when it became advantageous for his children that he do so. When Thomas signed up, in 1637, he was immediately thrown with Hathorne into the General Court. I would love to hear (have heard) Thomas' reaction to machinations of the Johns (and their cohorts). Again, one research mode will look at who contributes more (age-old issue, but very much of interest today and into the future). 09/17/2014 - The next issue of Gardner's Beacon (Vol. IV, No. 3) will have an Annals/Research focus. The use of Annals before Research denotes several things, one of which is that the Annals is expected to publish more than results from Gardner's Research. ... The next issue of Gardner's Annals will reprint the article from TEG Vol. 34. Too, it will print an article that is expected to be published in the November, 2014 issue of TEG. 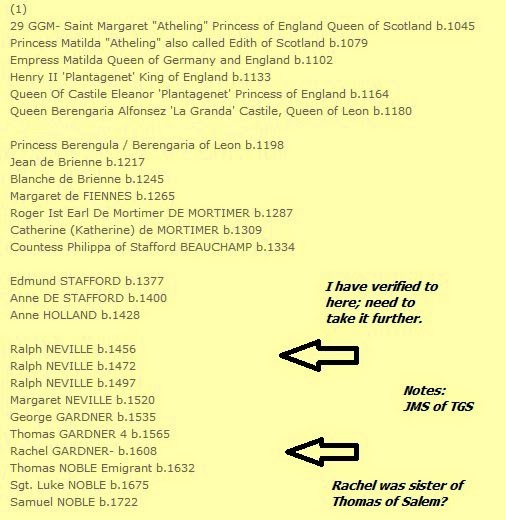 09/30/2014 -- Marriage record for Thomas Gardner and Margaret Friar found in Sherborne, Dorset. ... Vol. I, No. 2 published. 03/02/2019 -- We have published four volumes of The Gardner Annals and have printed these. We are building an index via images at our portal to truth. Researching Ipswich is an interesting task. They have the largest collection of early 1700 (plus or minus) houses in one area (see Ipswich walking tour). Each of these houses has a history which, then, can help build the picture of a family. And, Ipswich had enough of these houses that one could be disassembled and put in the Smithsonian Museum of American History. The image is from a 1761 Ipswich court record of a case in which a mother obtained guardianship of her son. Now, this son was over 14 years of age but was still a minor. And, his father had died, leaving three small children (but, he left land for his wife), when the boy was one year old. So, the mother had raised him for 13+ years prior to this request. Okay, she did have to establish her right to the obligation, given the times. As well, she had to have a couple of character witnesses. Another point, though, is the next thing we know is that the young man is in the Ipswich military; the time frame was the latter days of the French & Indian war. He is on several rolls including that of Capt. Nathan Brigham's company. So, being a minor, the young man needed someone to sign him up; his father was deceased. As an aside, some have said that this bit of friction involving the French was a training ground for the Revolution as many younger males were enlisted, trained, and learned from the experience. So, England trained its own rebels, so to speak. But, too, the revolution could have started in Ipswich, a recent columnist noted, almost a century earlier, to wit, Rev. John Wise's (1687 arrest by Gov. Andros - see Remarks, 08/02/2014) experience (he married Abigail Gardner who was a descendant of Thomas Gardner of Roxbury). There are more details in an upcoming article (TEG 34). But, the young man was signed up as John Leatherland, son of Sarah. Usually, the younger enlistees were noted as son of the father. That type of recorded association can be a nice genealogical boost. John, the enlistee in 1761, had been born in 1744. His parents were John Leatherland and Sarah Kimball, of Ipswich. His great-grandniece married a Thomas Gardner of Salem descendant. 08/02/2014 - Book Review, WSJ, 07/25/2014: The Revolution might well have happened a century before it did. When word reached Boston in April of 1689 that James II had fled England and that William of Orange had arrived from the Netherlands to take his place (the colonists didn't learn the news until months after it had happened), riots broke out across Boston. "The Body of our People," one observer noted, were encouraged to "assert our Liberties against the Arbetrary Rulers that were fleecing them." Already many colonists could think of colonial authorities—governors, even local authorities—as agents of a foreign power. 09/19/2014 -- Sarah (Kimball) Leatherland is mentioned in Gardner's Beacon, Vol. IV, No. 3. Today, I found out about Stories from Ipswich: Sarah Goodhue is Sarah Kimball's grandmother; I found this story on FB through Nutfield Genealogy. Sarah Kimball will feature in an upcoming issue of The Gardner Annals. The article will also appear TEG 34 (November edition). 09/30/2014 -- Sarah is featured in The Gardner Annals (Vol. I, No. 2).